Union Civil War reenactors hold the line at the 150th anniversary of the First Manassas/Bull Run reenactment in Virignia. Confederate Civil War reenactors at South Mountain, Maryland show company strength following a battle. Wet plate photograph. Confederate Civil War reenactors, at the 150th anniversary of the First Manassas/Bull Run reenactment in Virignia, steadily advance under fire. A CIvil War reenactor portraying a Union captain with his sergeant and two privates pose in front of the headquarters of Union General Meade at Gettysburg Military Park in Pennsylvania. Wet plate photograph. 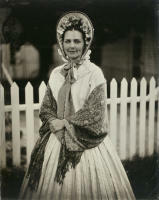 Women at a Civil War reenactment in California portray members of the United States Sanitary Commission, who provided care for the sick and injured during the war. The group was a forerunner of the American Red Cross. Southern women, wearing utilitarian work clothes and aprons, provide food for soldiers at a reenactment of the Civil War battle of McDowell, Virginia on the real McDowell Battlefield in Virginia. A Civil War reenactor's impression of a bugler with a Union militia unit stands with his instrument tucked under his arm at the 150th anniversary of the Civil War Battle of Wilsons Creek in Missouri. At a Civil War reenactment at the McDowell Battlefield in Virginia, a reenactor portrays Confederate General Thomas Jonathan Stonewall Jackson down to the last detail, even holding a lemon, something Jackson was known to eat during battles. His horse also resembles Jacksons horse Little Sorrell. Civil War reenactors in a Confederate battle line moves in a snake-like formation toward Union reenactors at the New Market Battlefield State Historical Park in Virginia. Confederate Civil War reenactors in Virginia portray seasoned veterens from 1864. Wearing an outfit she made herself, Civil War reenactor Maegen Hensley poses in front of the Drum Barracks Civil War Museum in Los Angeles, California. Hensley is a member of the Historical Citizens Association, a nonprofit Southern California reenacting group that seeks to educate the public about American history. 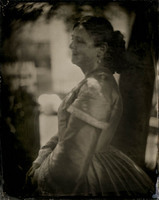 Wet-plate photograph. A journalist interviews a Union corporal at a Civil War reenactment in South Mountain, Maryland. Wet plate photograph. During the Civil War bands like this one, at a reenactment in Virginia, were often used to raise soldiers morale as they went into battle. The musicians also performed at ceremonies and concerts. During the Civil War sutlers provided food and other necessities so soldiers could augment their meager allowances. 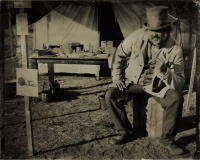 At a Civil War reenactment in the mountains in Southern California, where Camp Tyler, Texas, 1862 was recreated, a sutler sells canned fruits, lemonade and cigars. Instead of cash, soliders used stamps as payment. Wet plate photograph. At an American Civil War reenactment in England Paula Mountain Agar, left, portrays a male Union soldier and fights alongside her husband, Gregory Agar during a reenactment at Stanford Hall in Leicester. Confederate Civil War reenactors attempt to hold off Union soldiers breaching the trenches at the Battle of Spotsylvania in Virginia during a trench warfare scenario.